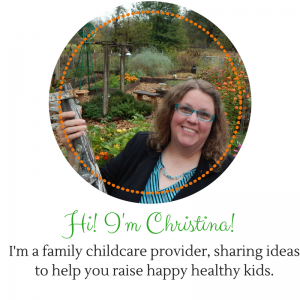 I am the queen of trying to add nutrition to every dish I serve my kids and family. Don’t tell anyone, but my husband has the taste buds of a two-year-old most of the time. 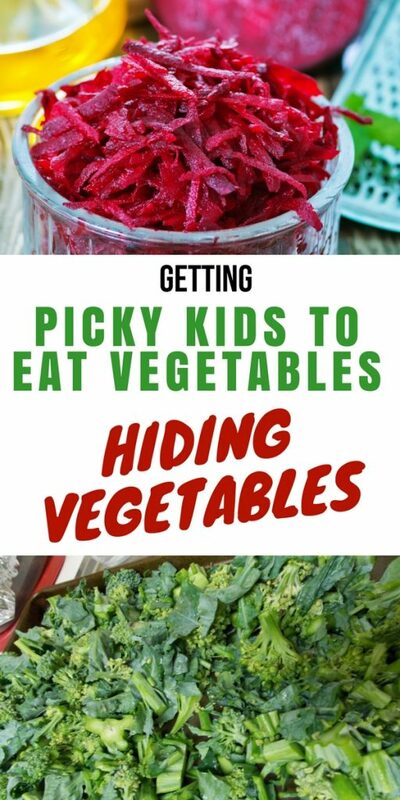 I have learned to get creative in getting picky kids to eat healthy by hiding vegetables. It’s not as difficult as you might think and it’s well worth the effort. 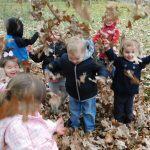 Nutritious foods are important for staying healthy and fighting off disease, but for small children, nutrition is even more important since they are still growing. Growing bodies need all the nutrients they can get to develop strong and healthy. So what do you do when your kids will only eat chicken nuggets and hate anything green? Believe me, I’ve met my share of picky kids. I know where you’re coming from. First, remember a food is new until it’s offered 11 times, so please, don’t give up on trying to get them to learn to like a new food you know is good for them. Also, letting kids grow their own healthy foods makes them 80 % more likely to want to try it. In addition, letting kids prepare their own food inspires them to want to eat it even more. Today we prepared a recipe together at preschool and I had a child try peanut butter that has never shown any interest in putting peanut butter anywhere near their mouth. I know it works, I am an expert at changing children’s minds about food. I have been helping kids learn to like healthy food for almost 20 years, and it would AMAZE you what will happen if you don’t give up! Make sure your food is colorful and inviting to eat. We eat with our eyes first, so make sure you would want to eat it before you offer it to the kids. Having a variety of textures, some crunchy, some soft, and a variety of temperatures, some warm and some cold is important as well. Please don’t be discouraged, we can never give up. Teaching children to like eating healthy is one of the most important things you can do to give them a good future. It’s worth our time! So what do you do with that child who just won’t eat anything but crackers or mac and cheese? HIDE good things in their food. I keep grated zucchini and yellow squash in my freezer at all times. I dehydrate a variety of healthy greens and blend it into powder. I also puree pumpkin, figs, and all sorts of other foods that will hide easily and keep it in my freezer as well. You can hide shredded yellow squash in scrambled eggs and under cheese on pizza, you can mix any shredded or pureed veggies in sauces, soups, and casseroles. 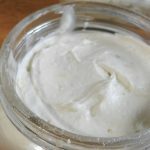 Purees can be hidden in baked goods. Spaghetti sauce is a great place to hide multiple veggies at once. You just have to get creative. Your children’s bodies will thank you even if your kids never know. 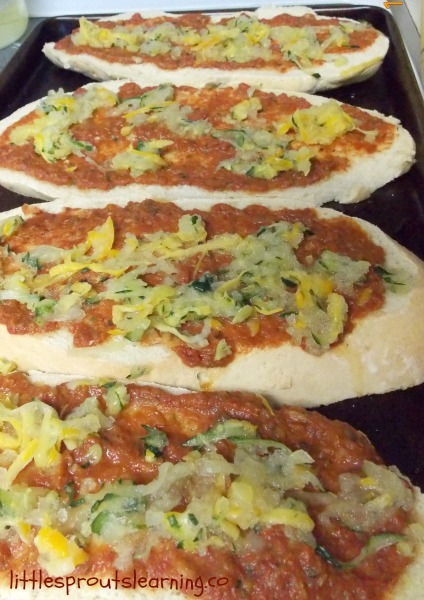 Recently I made some French bread pizzas for the kids. 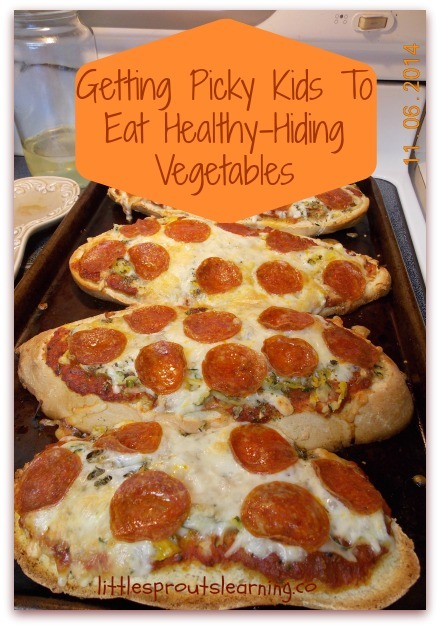 Kids love pizza, so it’s a great, familiar way to sneak in a little goodness. I make pizzas on tortillas, breads, or I make my own crust to roll out. The kids LOVE topping the pizzas as well for a fun activity. For this particular pizza, I started with some tomato sauce (click here to see how to make your own tomato sauce) to which I added minced garlic, Italian seasoning, and a few Tablespoons of dried greens that look like herbs. Kids are used to seeing herbs in pizza sauce, so this is a safe bet. Once I had the sauce on, I added a cup of shredded squash I had thawed from the freezer. Then I sprinkled on a couple of Tablespoons of dried greens on each slice of bread. Next, I added some shredded mozzarella cheese. 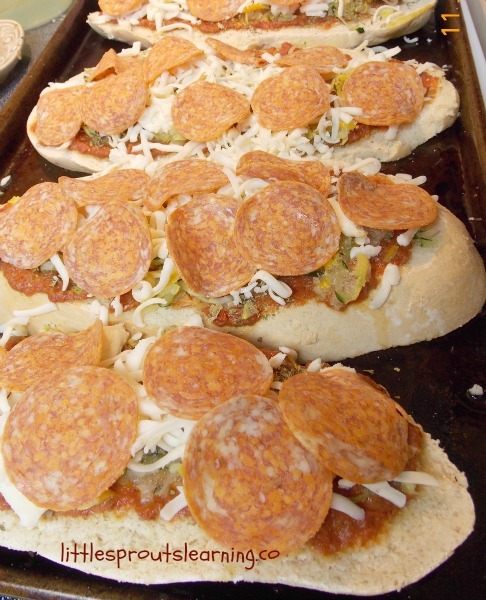 Then add some toppings the kids love, such as a favorite around here, pepperoni. We baked it up and the kids devoured it. Score one for healthy food! 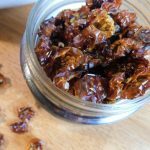 It’s easy to add extra nutrition to a recipe if you just think about doing it. 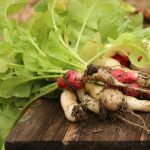 Do you have any great ideas for boosting nutrients in food? Such great and doable advice as always. Your kids (and Hubby) are lucky to have you. Love your posts. So smart and sane! !